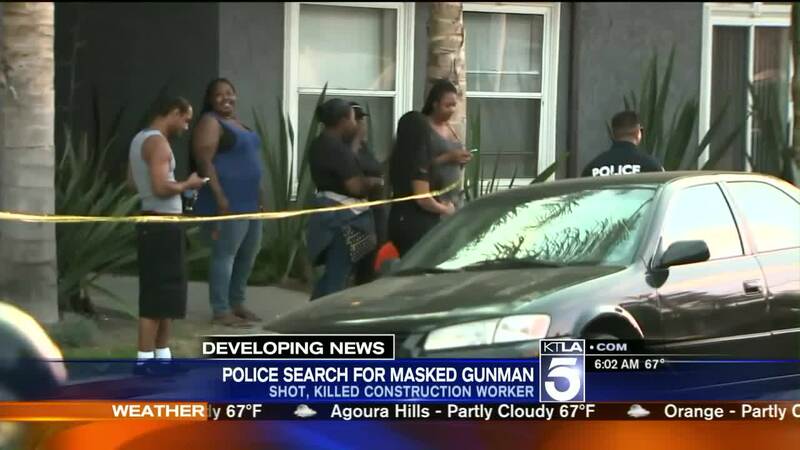 LOS ANGELES, Calif. (KTLA) -- Police are searching for a man who shot and killed one person in Venice on Wednesday, according to the LAPD Media Relations Section. The shooter is described as a 5-foot-8 inch, 25- to 30-year-old black man in a black, hooded sweatshirt, sunglasses and black jeans. An initial call said the man may have been wearing a "Star Wars" mask. Officers were called to the scene around 4 p.m. and found one victim dead at Seventh Avenue and Brooks Court. The shooter used a handgun and the weapon has not been recovered, according to the LAPD. Friends of the victim told KTLA the he worked for a traffic control services company and was the father of a 1-year-old child. In a video posted to Twitter by a witness, a man is seen laying on his back in the street. Aerial video from Sky5 showed multiple police officers at the scene and an intersection blocked off to traffic. Keith Friedlander, who lives near the scene, heard the commotion and went outside his home to find out what had happened. Another neighbor told him that a man walked up to another man and shot him in the back. "Someone walks up to somebody and just shoots them in the back? That's just horrible," he said.